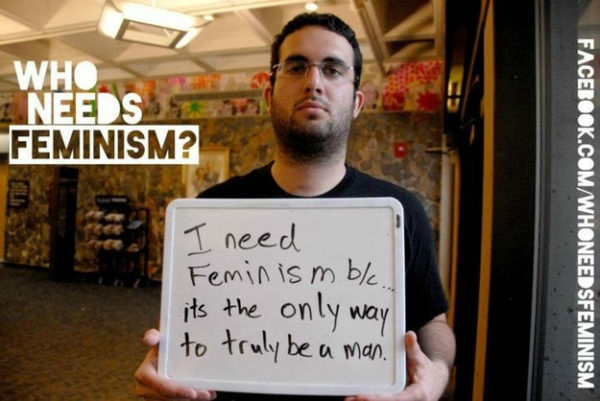 The topic of male feminists can be very divisive, depending on how it is perceived. There’s the issue of male voices drowning out those of women in a movement that is about women, or there is the knowledge that men being part of feminism is important because they need to be part of the movement toward gender equality. It can be a fine line balancing the two, but the fact that we are even having these conversations and learning from the process is also great. 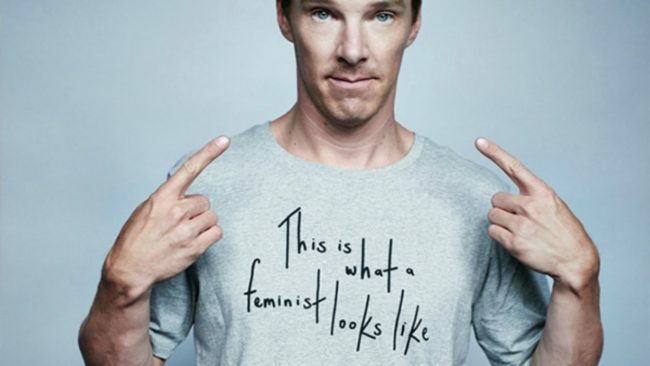 There are a number of celebrity men who are speaking up about gender equality, violence toward women, and unashamedly calling themselves feminists. Actor Terry Crews, Canadian Prime Minister Justin Trudeau, Chris Hemsworth, President Obama, and Matt McGorry. Matt has been quite the champion of pushing discussions about men’s involvement in feminism via his social media accounts. The ‘How To Get Away With Murder’ and ‘Orange Is The New Black’ star is a great example of a male feminist who is willing to listen, learn, and understand where he may be going wrong. At the recent Ms. Foundation’s annual Gloria Awards, Matt told TIME magazine that he recognizes his privilege even within the feminist space in a distinct way. “Speaking out about these things, as much as there’s a lot of sh-t out there that frankly hurts my feelings a lot, it’s never going to be as hard as being a woman or being trans or being black. And especially never going to be as hard as speaking out about sexism or racism as a woman or a person of color,” he said. He uses his learning experience to also challenge other men and bring them into the feminist conversation even if they are trying to bait him on social media or give him a hard time. 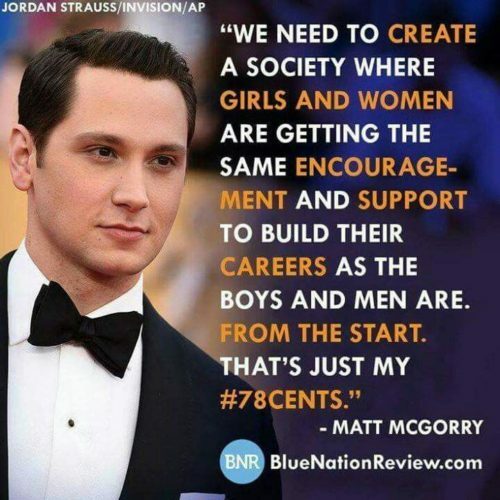 In a different interview with Cosmopolitan magazine, Matt expanded on the experience of male feminism and how the movement for gender equality has also impacted the decisions and perspectives he has in his acting career. “Playing a misogynistic character, for example, is not a problem to me, but it being a misogynistic project is a problem to me. If you look at like, ‘American Pie’ — it was on recently in a bar I was in — and the fact that they are all filming this woman naked on her webcam without her knowing, that’s fucked up. And the perspective of the film doesn’t portray that as [messed up],” he says. One of the interesting points Matt brought up to Cosmo, and one of the reasons we believe more men should be speaking about this, is how the patriarchal structure actually makes it easy for men to be feminists. “I think it’s easier to occur to women to be feminists, but I think it’s easier to be one as a man. You know, the threats against women, the level of violence is not really thrown at me. 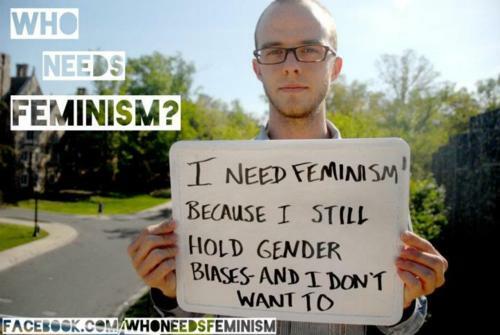 Most of the things men who are against feminism say to me, I don’t really consider insults,” he said. That is a sobering thought, but one that perhaps should be taken (at best) as a reason for more men to speak up. 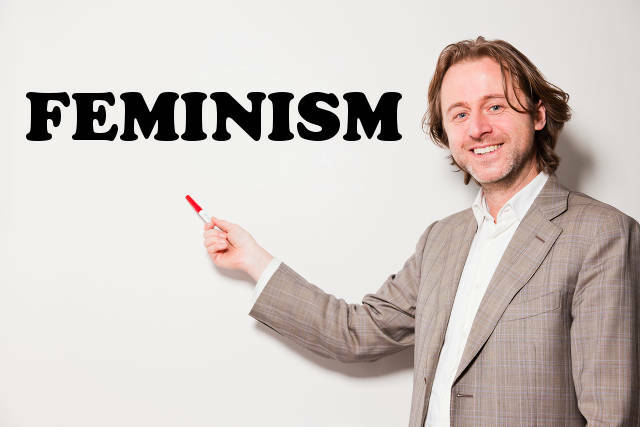 In order for men to understand the role they can play in feminism, which is to educate and challenge their fellow males on why gender equality is something they need to fight for too, it is important to see men lead the way and move past just a title, or any form of co-opting the movement from women. Ebony magazine recently published an awesome series in conjunction with the Ms. Foundation sharing stories of black men engaging with ideas of feminism. 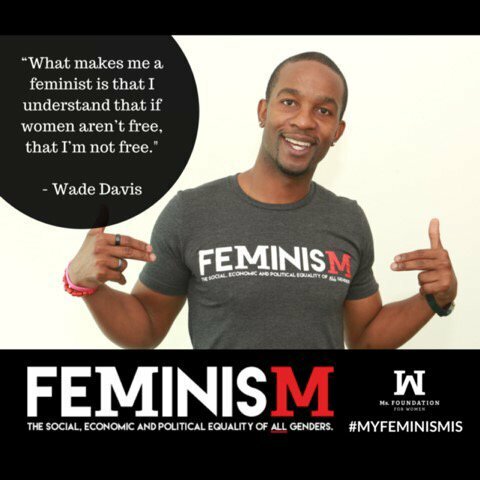 Former footballer Wade Davis who came out 9 years after he left the NFL, wrote a piece for the series titled “Why More Black Men Must Be Feminists”. His exploration of what it means to be a feminist was able to unearth and address some important perspectives from other men, especially in light of the fear and negativity surrounding the movement. “In order to get around this fear, I wanted to engage men in traditionally male-only spaces. So I headed to the barbershop. During my barbershop conversations, one thing was clear; openly identifying as a feminist was not the norm. Some highlighted how the word ‘feminist’ felt too closely related to the word ‘feminine’ and therefore they didn’t like it. Others offered a historical perspective as to why they didn’t identify with the word ‘feminist.’ Business manager Robert Lewis of Denver explained, “feminism to me has been a white woman’s issue and it’s not for Black people. In my mind, it has only been beneficial to white women and hasn’t had the same impact for Black women’,” he shared. One of the commonalities among certain men who are bold about declaring their feminism (yet certainly not the only condition) was those who had daughters or female family members and were for the first time able to see the world through that particular lens. “What’s clear is that regardless if men labeled themselves feminists, they were interested in offering their thoughts on gender equality and feminism in a one on one situation…Men explained that from Hillary Clinton to Michelle Obama to Beyoncé and even the Oscars, they were many reasons to discuss gender equality and feminism. But the one answer that men stated the most is that feminism/gender equality is important is because they have a daughter,” he said. It’s not just celebrities, who definitely hold a lot of social currency when it comes to pushing the needle on social agendas, it has to be communities of men everywhere talking to each other about feminism. Mark Anthony Neal, a professor of African American Studies and English at Duke University who also also happens to have a wife and two daughters, wrote an excellent op-ed talking about how feminism shaped his life, without even knowing the word. “It starts with my mother…she never uttered the word “feminism” in her life. She didn’t have to. Everything that she embodied including the pursuit of her own education outside of being a mother and wife…spoke to the tenets of feminism. She modeled for me what a self-assured Black woman was without ever uttering the phrase “I am a feminist.” Every one of the choices she made for herself and her family was born out of the belief that she simply had that right and never needed to ask permission beforehand,” he writes. Growing up in a world where he recognized the struggles of not just race, but also gender first hand, he has been able to apply this to his own life and family and unashamedly want to promote black male feminism. “Our daughters Misha and Camille have had front seats to their parents balancing of gender expectations. To them it has meant living in a world where they both expect and demand to have a voice, often to the frustration of various teachers and administrators who are quite befuddled by Black girls who speak their minds with passion and precision. The administrators often say that our daughters are defiant, exhibiting skills that are usually encouraged in their male peers. And yet, it is the tradition of Black feminism that has produced generations of defiant Black women like the Combahee River Collective, Sojourner Truth, Ella Jo Baker and Bree Newsome,” he said. He goes on to explain how through his line of work, where he coaches men and women, he sees such a difference in the messages and social codes given to different genders that it has made him realize why feminism is important to everyone, and why men need to be part of furthering the cause. “Being a feminist, I hold my female clients to a higher standard, because I see that sometimes they’re holding themselves to a lower one. Society already celebrates manhood, and so I aim to elevate womanhood. Sometimes I have tough conversations about sexism, and I remind my female clients that they might need to work a smidgen harder to get the same results as their male counterparts…I just hope to see the day when women’s earning power and career development are not circumscribed by their gender. Until then, we’ve all got our work cut out for us,” he said. All this advice and range of perspectives is helpful, but where do men start if they want to get involved in feminist conversations? In an article for PrimeMind.com, Tal Peretz, professor of Sociology and Women’s Studies at Auburn University who has also written extensively on sexism and anti-violence activism, helpfully lays out some basic groundwork. “Learning about feminism didn’t just illuminate sexism, it explained television and bullying and sports and economics and my family and countless other things I’d been uncomfortable or confused about. Using a feminist lens to analyze and understand your life is one of the most powerful things you can do. This is what led me to realize that sexual violence and domestic abuse; inequality in pay, education, and politics; biased media representation; gender stereotypes; and beauty norms aren’t women’s issues, they are social issues that shape everyone’s life. Understanding how men are gendered beings —yes, including you—can be transformational,” he began his piece. Here are some of the things he listed as a way to help other men engage in feminism: understanding that having privilege means you don’t see how gender inequality impacts your life, to be aware of your communication behaviors, learn how to listen to women, and don’t just declare that you are an “ally”, show it in your actions. These are the kind of “woke bae” messages we need to see more of projected in the media. The more we are able to present feminism as such a complex, nuanced and intersectional movement, the more likely we are to include men and allow their unique perspectives (and indeed privileges) to help further the cause of gender equality. We can spend time getting bent out of shape about men’s voices speaking up about what is primarily seen as a “woman’s issue”, or we can find ways to work alongside our male allies and counterparts with full knowledge that they have the ability to reach communities of men that perhaps we cannot. This is why we believe in the continuing feminist conversation!